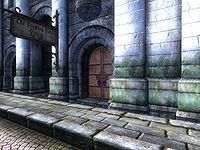 The Foaming Flask is a small inn located in the Imperial City's Talos Plaza District. It is found close to the gate to the Elven Gardens District, next to Soris Arenim's and Ra'jiradh's Houses. The proprietor, Ernest Manis, will buy potions and food while only selling the latter. The main reception area is on the ground floor and consists of a bar with a counter and dining room, all laden with food and drinks. There are no rooms that can be rented here; the second floor holds Ernest's private quarters, as is usual with Imperial City houses and stores. They consist of an antechamber used for storage and a second room with a writing desk, dining table and a bed, which you are free to sleep in, as entering is not considered to be trespassing. Esta página foi modificada pela última vez à(s) 04h48min de 6 de junho de 2013.